Textile printing is an old age fashion, which has grown continuously as the years passed, the textile printing machines have replaced the hand printing to augment output and procure more précised and creative printings with an ease. In this textile printing line, the conveyor belt is used to continuously convey the textile material throughout, which needs to undergo colors, oils, chemical and dyes. We as a manufacturer of the conveyor belt have served many of the textile industries with our matchless quality conveyor belt and hence know what exactly textile industries look for and to match their requirements at the farthest, we present the cutting edge range of the conveyor belt for textile industries that gives you all you need at the best rates in the market. 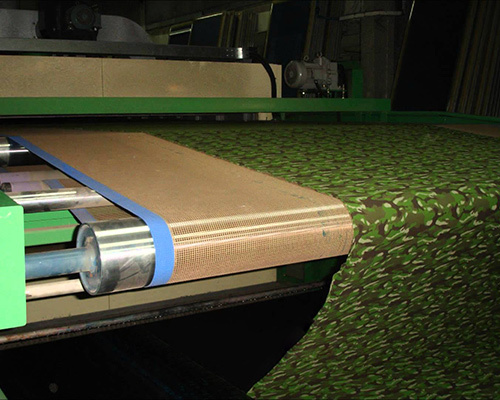 The offered conveyor belt is made of PVC/PU material and is a better incorporation of our experience and expertise that attributes highest resistance against chemicals, oils, dyes and water, whereas it’s easy to release property makes the cleaning task easier for the textile industry, therefore it has become the indispensable part of the textile industries to accomplish any textile printing task effectively. This textile conveyor belt is made following strict quality control and hence compliance with all the international quality regulations, which makes it a truly safe and reliable approach for the textile printing industries. The excelling performance and the no maintenance requirement are the feedback of its use, needlessly delineates its competence in textile printing industries, available in the miscellaneous range of the widths, lengths and profile patterns at the affordable prices all over.